Sunday night’s star-studded fundraiser at the Geffen Playhouse and the pre-show host committee dinner grossed over $1.5 million, a record, for the Geffen Playhouse’s education, outreach and artistic initiatives. 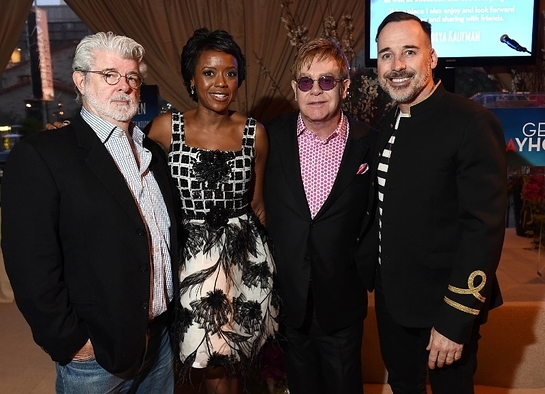 Multi-award winning composer and a Geffen Playhouse Board Founding Trustee Quincy Jones presented the Distinction in Service Award to Ariel Investments President Mellody Hobson and distinguished filmmaker George Lucas. 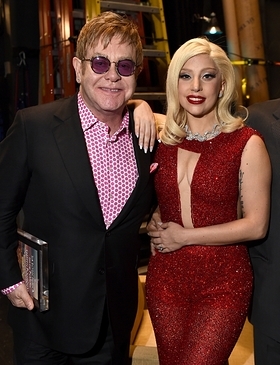 Tony nominated director Jason Moore presented the Distinction in Theater Award to producer David Furnish and internationally renowned singer/songwriter and performer, Sir Elton John. David Geffen served as Honorary Chair of the event; Linda Bernstein Rubin and Loretta Everett Kaufman Co-Chaired the Backstage at the Geffen committee. Pamela Robinson Hollander and Martha Henderson Co-Chair the Geffen Playhouse Board of Directors. The evening was beautifully produced by Gil Cates, Jr. and directed by Randall Arney.